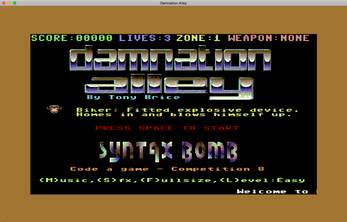 Damnation Alley is a tribute to the all time classic C64 game, Spy Hunter and is available for both Mac and PC's. 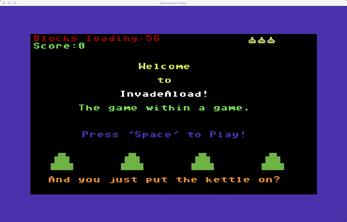 Also featured is the InvadeAload space invaders game that used to be playable while the main game loaded from tape. Esc can be pressed at any time in that game to jump straight to the main game. 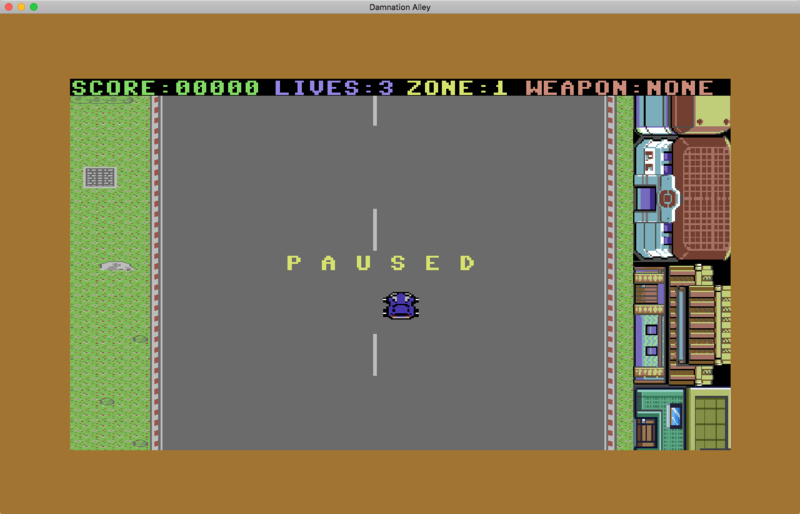 Your mission is to traverse the former racing track called Damnation alley and deliver essential medical supplies to another city at the end of Zone 4. Due to years of disuse, there’s not much to see in any of the four zones, apart from several damaged areas from the nuclear war of 50 years earlier. There are, however, numerous hazards on the way, such as groups of annoying bikers, former police cars that try and maintain order, custom vehicles with tyre shredders built into their wheels and some heavily armoured cars that you should try and avoid wherever possible. The state will pay out bounties on certain vehicles due to their crime of trying to prevent you doing your duty. Former police are also considered outlaws, and fair-game, should they interfere with your important task. You are fully authorised to take out any vehicle that stands between you and your destination apart from civilian vehicles. Should you destroy one of those with your guns then you will incur a penalty preventing additional bonuses for a short time, so you are discouraged from this course of action. In order to help you on your journey there are several state-funded shops that will let you have a weapon of your choice to use in conjunction with your guns. Smoke will block visibility of trailing vehicles and likely force them to drive into something they shouldn’t - like a lake. Oil has a similar effect but it’s got further consequences of also spinning the vehicle out so it can potentially cause further damage before the affected vehicle actually impacts something destructive. If you would prefer to just lay bombs behind you as you drive then feel free to choose that option but be warned: the police cars don’t like it. The state would remind you that while the use of weapons is authorised, there are cost penalties for using them. Namely the reduction of your bonus for completion of the mission - should you actually reach the end of Zone 4 and deliver the supplies. Cursor keys to move vehicle and Accelerate/Brake. Space will fire your guns and also confirm selections in the shop. Ctrl or Shift key to fire special weapons - if you have them equipped. Q in-game to quit to title screen. P in-game to pause game. L on title screen to change level. F to toggle full screen - on Mac you sometimes have to double tap the key (out of my control). M and S to toggle Music/Sound. Esc at any point to exit the program - you will need to confirm with (Y/N). Shredders can only burst your tyres on side impacts. Keep them in front or behind you and shoot them quick. Police cars come after you for a short time if you drop a Bomb or use Smoke/Oil but are relentless in their pursuit if you happen to collide with them. Be careful they don’t smash you into something because they will try to. Civilian cars can be destroyed without a points penalty if you don’t shoot them but bang them off the road instead. This does not get you any points, however, but bumping them into other cars for the knock-on effect can sometimes be useful. Shredders will burst your tyres but your vehicle is fitted with a reinflation system that will get them back up again after a bit of time. Normally you’ll end up off the track first but you can time it so you bang a Shredder and then hit another vehicle while you are out of control which can give you enough recovery time. Trucks are not affected by collisions as much as you are. They also don’t seem to mind too much if you do it to them. It’s easier just to shoot them, however. Enforcer cars can’t be shot. You can bump them about but the rumour is they get a bit annoyed about it after a while. 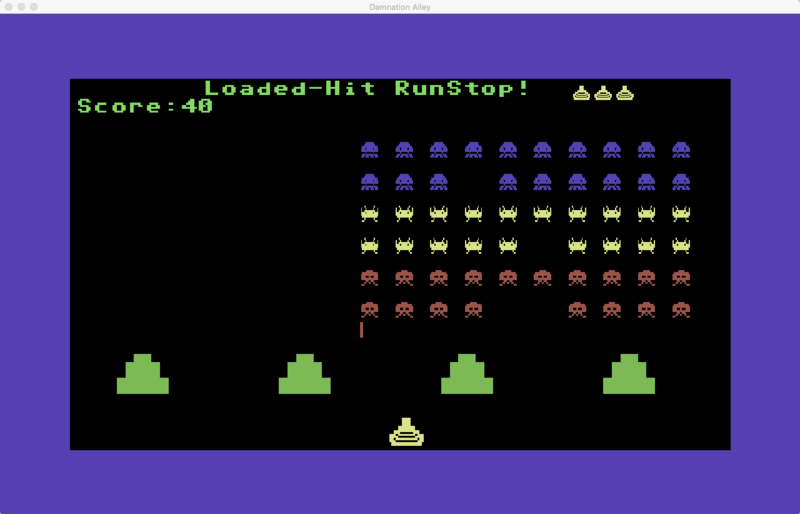 This game was written for the Syntax Bomb coding competition number 8, where the theme was Retro-Wars. 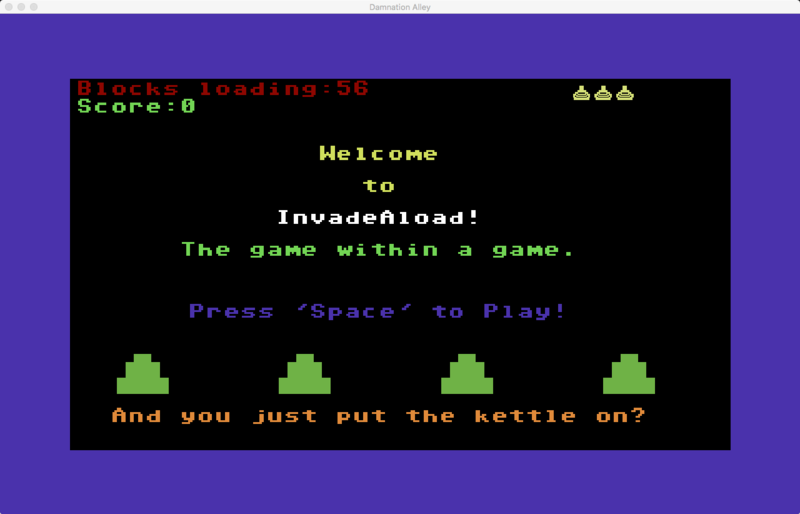 You had the choice of making a game in the style of any of the popular 80’s home computers such as the C64, Spectrum, Amstrad or BBC Micro. 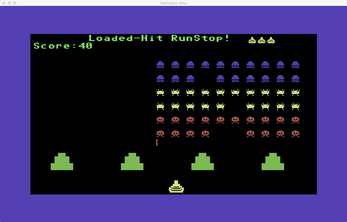 As everyone knows, there was only ONE TRUE home computer of the 80’s so I decided to make a game in the style of a C64 production and the graphics palette is faithful to that machine. Apart from a few minor exceptions, the graphics restrictions for multicolour mode are also accurate to the 21 double pixels width and the sprites are all proper size but scaled up for modern monitors. Based on the Micro Machines Macro Mix for NES. With thanks to Qube for hosting the Syntax Bomb game coding competition. Developed with GameMaker Studio 2, Bfxr, MultiPaint, Image2Icon, Dash, Sourcetree & Parallels. A note about the graphics. The background elements of the tracks were created by Davide Fichera and I have only created some extra tiles to fit in where needed so I could use them for this game. 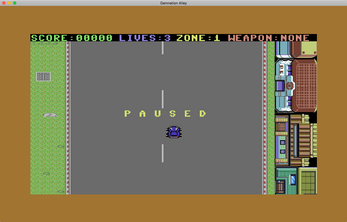 Davide also created the pedestrian car sprites and the player car. The crude tyre animation was added by myself just to give the impression of acceleration - his work is much nicer. Many thanks to Davide for allowing me to use his work. 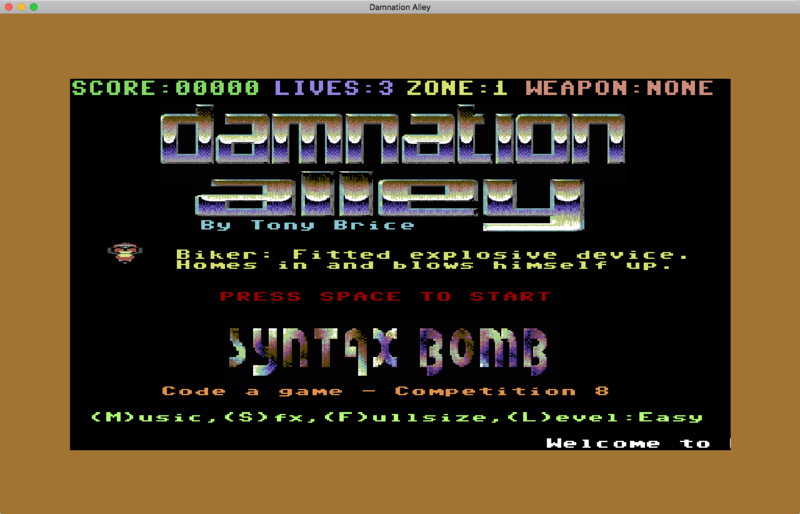 The game theme is based on a book called Damnation Alley written by Roger Zelazny back in 1969. Damnation Alley is a free game. You can pass it on to whoever you like. However the code and all the elements created by me remain my property. The music and graphics that I haven’t created are copyright their credited authors.